This weekend's Dr McKenna Cup action includes Sunday's Section A tussle between Derry and Tyrone and Down's Section B encounter with Fermanagh. Sunday's latter game has ex-Down boss Peter McGrath taking the Ernemen to Newry as they face his native county. On Saturday evening, Cavan host Ulster University in Section C after they both won their openers last weekend. Sunday's action includes Monaghan's meeting with Armagh plus Donegal v St Mary's at Letterkenny. Game of the weekend is probably Sunday's Section A derby between Derry and Tyrone at Owenbeg. 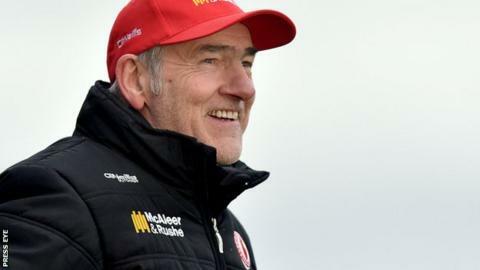 New Derry boss Damian Barton was never afraid to get stuck into Tyrone opposition in his playing days and it will be interesting to see how his Oak Leaf side perform against Mickey Harte's outfit. As he indicated after last weekend's opening 4-16 to 2-12 win over Antrim, Barton has made several changes for the Tyrone game with keeper Thomas Mallon, Mark Lynch, Benny Heron and Conor Murphy among those drafted in. Shane Heavron, who scored two goals in his debutant outing, is left out of Sunday's squad as Barton opts to look at other members of his panel. Harte hands a debut to Trillick's Richard Donnelly while Padraig Hampsey, Jonathan Monroe, Niall Sludden and Kieran McGeary also start after making their debuts last weekend. Both Monaghan and Armagh are looking for their first points after home defeats by Ulster University and Cavan. The Ulster champions were beaten 2-16 to 1-9 by the students last weekend with Armagh paying for firing 16 wides as they were edged out 2-8 to 0-11 by Cavan in a game which had five red cards. Armagh, already without several regulars who are missing the McKenna Cup, will also be without Brendan Donaghy's following his straight red card against the Breffni County. Monaghan boss Malachy O'Rourke hands debuts Rockcorry trio Jamie Smith, Niall McKeown and Fergal McGeough plus Blackhill's Donal Courtney. Derry forward Cailean O'Boyle and Mayo man Evan Regan scored the UU goals last weekend and it was a particularly impressive win give that several inter-county players, including Donegal's Paddy McBrearty, Monaghan's Ryan McAnespie and Antrim's Ricky Johnston, were missing for Barney McAleenan's side. Cavan will be without David Givney, Joshua Hayes and Killian Brady following their straight red cards against Armagh but Eugene Keating could be involved for the Breffni men after returning to the county squad. Fermanagh paraded a mix of youth and experience as Ciaran O'Flaherty's late goal helped them edge out St Mary's 1-13 to 0-14 in their delayed Section B opener on Wednesday night. Peter McGrath has indicated that he will use Sunday's match against Down as an opportunity to have a look at a few more of his new panelists although he may retain experienced attackers Tomas Corrigan and Sean Quigley after their crucial contributions at Garvaghey. Down lost their opener against Donegal but showed some promising signs with debutant Gareth Johnston and Arthur McConville looking lively in attack and Ryan Mallon and Ryan Boyle also performing well. Frank McGlynn's early goal ultimately was the difference between the sides at Ballybofey and it will be interesting to see whether Donegal boss Rory Gallagher opts to start the Glenfin man, normally a half-back, at full-forward again against St Mary's College. Derry: T Mallon; R Ferris, D McBride, O Duffy; D Heavron, C McKaigue, M Craig; Emmet Bradley, M Lynch; C McFaul, C Bradley, B Heron; E McGuckin, R Bell, C Murphy. Monaghan: J Smith; K Duffy, D Wylie, N McKeown; D Mone, C Walshe, D Courtney; N McAdam, M Thornton; D Malone, S Gollogly, O Duffy; F McGeough, B McGinn, D McKenna.